Hi All! 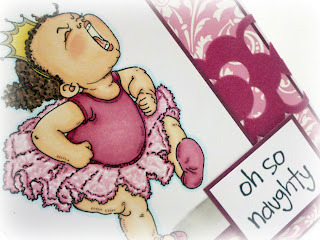 I'd say I've got a sweet little card for you but that would be a lie :) The challenge over at Mo's Challenge blog is Show Me Some Attitude and it's such a fun one because Mo has the best digi stamps that just scream attitude! I'd been browsing through Mo's shop and absolutely fell in love with Two Tasha (grab it here) with her tutu and scrunched up angry face- just makes me want to stamp my foot and say 'You're not the boss of me!' 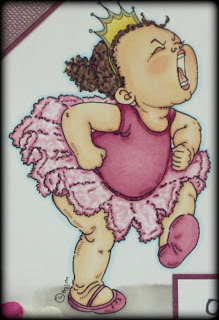 just cause it really can make a girl feel better :) And what goes better with a little girl in a tutu having a temper tantrum than a lot of pink? I imagine it would probably match her little cheeks as she really got ramped up. If only we could get away with this type of emotion at any age! Very cute card Katie. The colors you used on the image match so well with the pretty DP. Personally, I'm glad adults can't throw fits like that.....altho some do come close, don't they?! Thanks for shining in our SHINE ON challenge at DYSU this week. Good luck in the draw! I love the image and I love yoru coloring - amazing. Thanks for joining us at Do You Stack Up. Brilliant coloring on this little lady! I’m so glad you were able to play with us at Mo’s challenge this week! This was the image I thought of immediately for my DT card! This is great! I love the embellishments, and your coloring is wonderful. Glad you joined us in Mo's Challenge. Oh Katie...how absolutely delightful!! Yep...definitely copping an attitude here! That Tasha...what a stinker! She's just been added to my "must have" list!! Thanks for the fun inspiration. What can I say...I love this card! So glad you joined us this week at Mo's! And I agree...Mo's images all scream attitude!! LOL! Oh this is so cute, gorgeous card.